Remember in my December moodboard post I mentioned that I wanted to go with a black, white and gold color theme this holiday? This idea was all great in theory until I realized I needed all new ornaments! Needless to say, I didn't want to spend a ton of money, especially on ornaments that may not fit my color theme for next year. Plus, I don't know about you, but I rarely see a whole lot of black and white ornaments out on the market. So, I took matter into my own hands and created them. Paint - I went to Lowe's and purchased two tester pots of paint ($3/each). They will mix any color your heart desires. I went with iron black and bistro white (not shown). Clear glass or plastic ornaments - Because I waited so long, I could no longer find any clear glass ornaments, so I went with plastic. At .50 cents a pop, the price was right. Metallic gold spray paint - I used this spray paint to color the metal tips of the black ornaments. (I may have spray painted some other things too. ;) For the white ornaments, I used the brush to simply paint the metal tips with the iron black paint. MS metallic gold paint - I used this paint to draw dots and crosses on some of the ornaments. I wasn't thrilled with the results, thus no photo. However, the bottle made the supplies shot, so I thought I should explain. Ha! 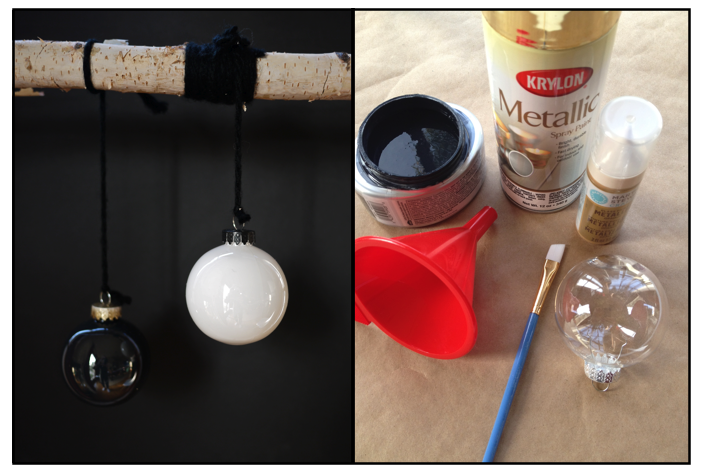 Funnel - To easily pour paint into the ornaments. Brush - For painting the metal tips of the (white) ornaments. Egg crates (not pictured) - For drying the ornaments. directions: using the funnel, pour just enough paint into the ornament so that when you swirl the paint around it will cover the entire inside of the ornament. place in egg carton to dry. that's really it! if you're feeling adventurous, you could swirl the paint so that it only covers the bottom half or swirl it haphazardly for a spilled paint effect. go crazy! 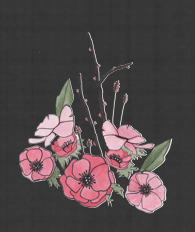 I first saw this idea last year on Sania Pell's blog and I was thrilled with the results. 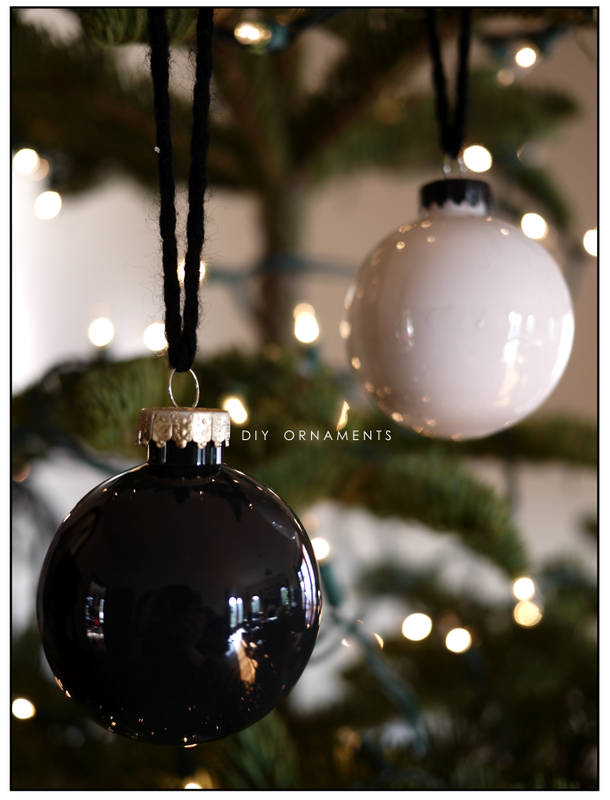 This simple diy will help you create ornaments in any color scheme you like. AND, the best part, it's really easy! If you can pour paint, you can successfully complete this project. I promise. Easy enough, right? So tell me how you're being crafty this year? They look awesome, Theresa! Super glossy and sleek, such a fun departure from the standard red glittery ones I have, haha. I am hesitant to try this, only because putting a can of metallic gold spray paint in my hands is a recipe for disaster --unless the intent was for me to spray paint everything in my house! Everything looks better with a little gold, don't you think? I love how yours turned out. wow - simple and stunning. my favorite kind of project! Aha! This must be the craft project you completed over the weekend. I absolutely love the way these turned out. They look like a black and white version of the rainbow ornaments from Land of Nod. Lovely and so classy, Theresa! First Hair deco for Eames, now christmas tree decorations! Well done you and thank you for the tutorial. These look seriously classy! I'm going to put this on the list for next year. They turned out gorgeous! Was it easy to find the clear ornaments? Fabulous idea! Crafty you are :) Pinning this for future reference! I'm so NOT a DIYer. Not! But this is brilliant and super easy. I love that you paint INSIDE the ornament. That part's brilliant. And they're beautiful. If they don't go on your tree next year, I could see them decorating your mantle, or a ceiling in a room or something. Great job, T! these look so pretty, i can't believe they are plastic, they don't look like it at all. but honestly that is nice because i at least 5 of my glass ornaments end up getting broken every year. love this DIY!!! so simple with such a chic result!